The next NUJ Bristol Branch meeting, open to all Bristol NUJ members, is Thursday 24 March at the Pervasive Media Studio, Leadworks, Anchor Square, Harbourside, Bristol BS1 5DB. The meeting will start at 6.30 p.m. Pervasive Media Studio is above the Firehouse Rotisserie restaurant. Please ring the buzzer at the entrance to the Studio which is a white wooden door with circles painted on it, round the corner from the restaurant entrance and near the big red chimney opposite the @Bristol reception. You can find it on Street Maps, and there are useful location photos on the Pervasive website. Being in the centre there are good bus links, and there are also two car parks on Harbourside. 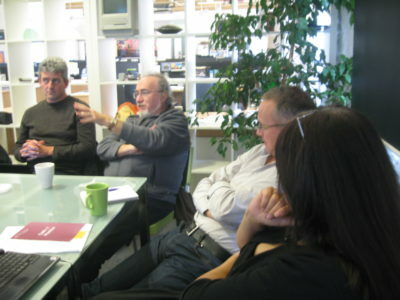 Among our main business will be discussing motions and amendments to the NUJ Delegate Meeting in April 2011. DM 2011 is a rule-changing conference, where delegates can pass motions to change the NUJ’s rules on any aspect of union policy including campaigning, membership criteria, and internal democratic organisation. If you’re an NUJ member, we need your participation so that the Branch and the NUJ can act on your behalf. The DM 2011 Final Agenda has now been published and can be downloaded here from the main NUJ website, along with the Annual Report and Financial Statements. Bristol Branch submitted eight motions and made amendments to some of these and other motions. Please read through the Final Agenda and if you’re an NUJ member who feels you want the Branch delegates to support or oppose any motion or amendment, then please come to the Branch meeting tand state your views. It is still possible for the Branch to submit Late Notice Motions to conference. But this must relate to events that have occurred since the latest date for receipt of motions which was 06 December 2010, or to the accounts. If any member wants to raise anything in particular please feel free to contact Simon Chapman, Branch Secretary, in advance of the meeting. So calling all NUJ Bristol Branch members: Come along and have your say on any issues, and what you would like to see happening within the Branch and in the NUJ.